…with the intention over the last decade or so of digitizing the content and uploading to the Yootletubers for all to enjoy. About 16 minutes after I posted the link to this on my Twitter, it popped up on Metafilter, so you may have already seen this, but I had to have this on my site. I love this ol’ VHS tape. 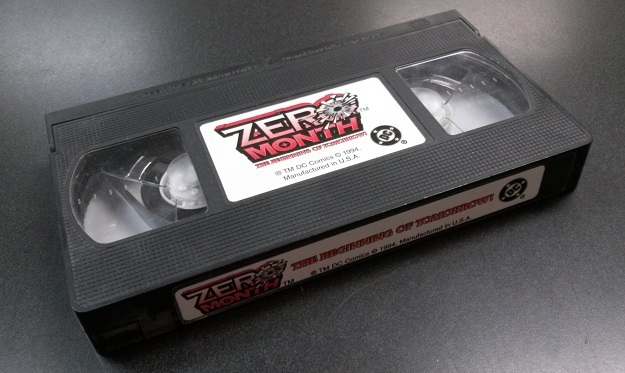 Now I just need to digitize this Hero Illustrated promo tape I’ve got sitting around…. Wow. I…kind of love the idea of Parallax in front of a bank of monitors, commenting on DC Universe developments, mostly through weird non sequiturs. I don’t think I’ve ever related to Hal Jordan as much as I have while watching this! My favorite part? “Primal Force will always be there”…for 15 issues, anyway…! Oh wow, that is… something!